The silicon used in the X1950 Pro is based on an 8-vertex 36-pixel shader configuration. While the X1900 GT has the same pipeline configuration as the X1950 Pro, the X1900 GT is based on R580 cores with disabled or non-functional pipelines. 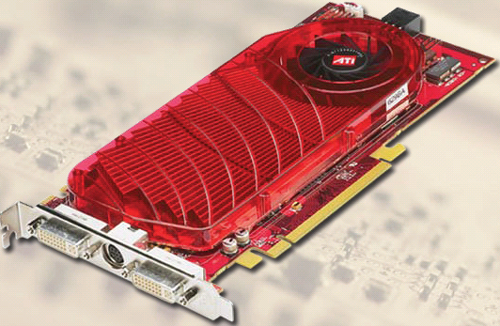 The RV570 core is built with the X1950 Pro in mind. With the introduction of the X1950 Pro, the X1900 GT will be phased out. It is unclear whether or not ATI has a use planned for R580+ GPUs that don't make the cut on the high end, but it looks like they won't just fall neatly into the X1900 GT. We would like to say that the X1950 Pro has the same core clock speed as the X1900 GT, but the issue is a little more complicated. The X1900 GT will be going through a slight revision before its disappearance. Due to a shortage of original R580 cores that can clock to 575MHz, ATI is dropping the specs on the X1900 GT to 512MHz while attempting to make up for this by boosting memory speed to 1320MHz from 1200MHz. This is being done to keep the supply of X1900 GT parts steady until the X1950 Pro is able to take over. It is difficult to describe just how inappropriate it is to retard the specs on a long shipping product in this manner. It is hard enough for us to sort things out when parts hit the shelves at different speeds than originally promised, but to do something like this after a part has been on the market for months is quite astounding. Be very careful when looking at buying an X1900 GT over the next couple months. The safest route is to avoid the X1900 GT altogether and simply let the X1950 Pro act as an immediate replacement for the X1900 GT. Leaving 512MHz product sitting on shelves is the best way to send the message that this type of action is not to be taken again. For our part, we have to express our extreme disappointment in ATI for taking this route. We certainly understand that it is difficult to make decisions about what to do when faced with product shortages, but we would like to strongly urge everyone in the computing industry to avoid doing anything like this to stretch the life of a product. For now, let's get back to the X1950 Pro. 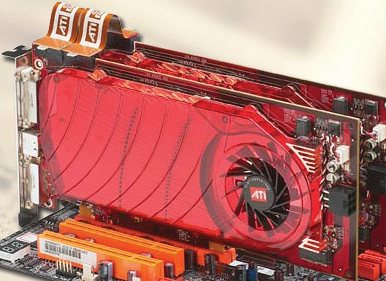 Weighing in at about 330 million transistors and about 230 mm2, the RV570 is no small GPU. In addition to the features listed below, RV570 includes an integrated compositing engine for what ATI calls "native" CrossFire support which we'll explain shortly. The heatsink has a different look to match the rest of the X1950 family in a single slot solution. There are also the new CrossFire connectors in nearly the same position as the NVIDIA SLI bridge position. Here are some pictures and tables to help illustrate.